This is my first finished lampwork piece!!! 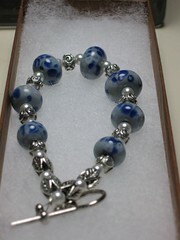 That's such a beautiful bracelet, and I never would have guessed the beads were first time lampworking! They look so smooth and lovely. Great work! Absolutely beautiful! I'm sure your grandmother is going to love it. Noelle, I have been lampworking off and on for 4 years. I'm still a beginner!! This is my first finished piece of jewelry. i usually just make stitch markers for myself.